***Bentley will make its 500th start for the Continental GT3, with the No. 8 entry of Vincent Abril, Andy Soucek and Maxime Soulet hitting the milestone in today’s race. A pair of Bentleys are also taking part in this weekend’s China GT Championship races in Zhuhai, which took place right before the race gets underway at Spa. ***Even though the Audi Sport banner and livery might suggest the opposite, the No. 5 WRT car is not a factory entry. ***McLaren GT was the only manufacturer that didn’t make it into top 20 Super Pole session yesterday. Factory driver Rob Bell told Sportscar365 that Strakka Racing is having difficulties getting temperature in the tires on the McLaren 650S GT3. ***The 63-car entry list does not exclusively consist of GT3 cars, as there are also two Porsche Cup cars entered in the event as Group National competitors. However, both cars are not in the same specification. The RMS is of the previous generation, while the Speedlover car is brand-new. In an effort to balance both cars, a BoP adjustment gave the newer Porsche 25kg extra weight and a 2cm ride height increase. ***President and CEO of Automobili Lamborghini Stefano Domenicali, Stephan Winkelmann, the CEO of Audi Sport GmbH and former head of Audi Motorsport Dr. Wolfgang Ullrich are all present in the Spa paddock to keep track of respective teams. ***Drivers may not flash their headlights as a warning or indication more than three times in succession between any two successive corners. Any car reported to have exceeded this number of flashes will be given a warning. A second infraction for any car during the meeting will result in a drive through penalty. ***There are indications that Porsche could increase its presence at Spa next year, amid a shifting of some of the former LMP1 program’s resources to GT racing. A single 911 GT3 R is running in the top class this year, run by KÜS Team75 Bernhard. ***Pirelli expects more than 1,200 tire changes will take place during the race. ***The No. 00 GoodSmile Racing & Team UKYO Mercedes-AMG GT3 of Kamui Kobayashi, Tatsuya Kataoka and Nobuteru has lost its manga livery following a crash during qualifying on Thursday evening. 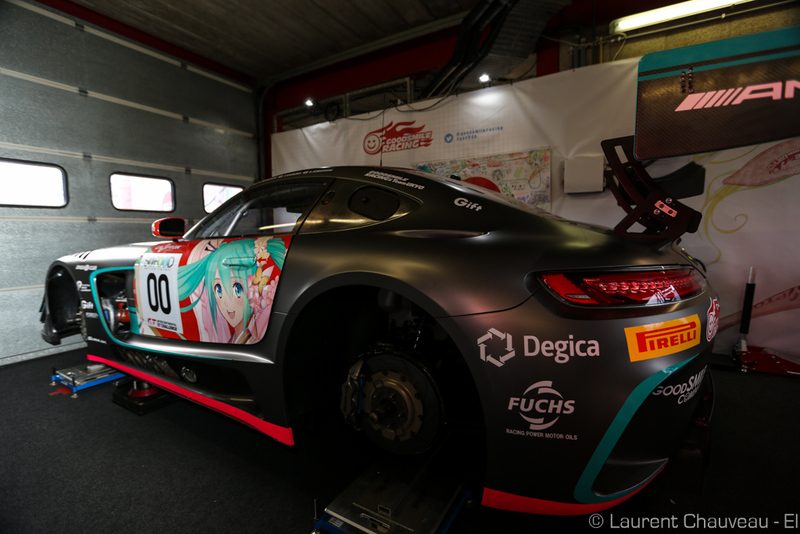 The team switched chassis and the only remaining manga graphics can be found on the left door (photo). ***Be sure to download the official SRO Spotter Guide, which features all 63 starters for today’s race, including all the new liveries and lineups. Click here to download the Spotter Guide, click here to download the starting grid and click here to download the starting driver list. ***Eurosport TV will be providing live coverage of the race on its European and international services. English commentary will be by Mark Cole for the start, and then for further visits Sunday morning and for the finish. UK viewers can catch it at the BST times below: Saturday 3:15-4:30 p.m.; Sunday 7:30-8:30 a.m.; 10 a.m.-12 p.m.; 2:30-3:45 p.m.
***For North American viewers, watch live coverage of the race on MotorTrend On Demand beginning at 10 a.m. ET. A one-hour highlights package will air Sunday at 5:30 p.m. ET on CBS Sports Network. John Dagys and Laurent Mercier contributed to this notebook.